UBP's specialist teams cover many emerging market assets across various global locations and conduct their own direct fundamental in all major emerging markets. This presentation will set out a number of supporting reasons for investors to include Emerging Equities as part of their asset allocation strategy. 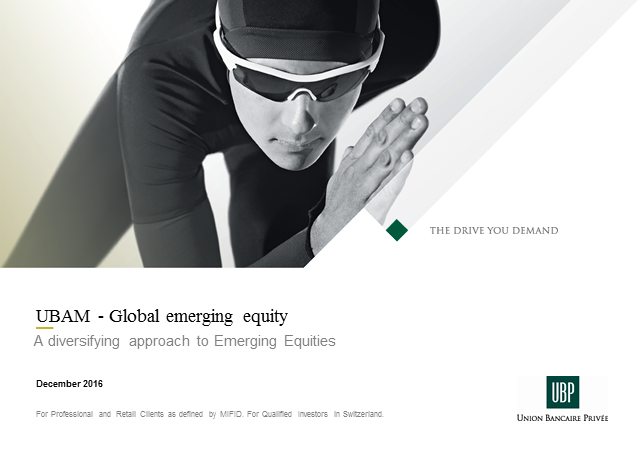 We will explain how, in addition to attractive potential returns, an exposure to Emerging Equities can help to diversify a global equity portfolio so that it benefits from the current improvements in research. The presentation will also tackle the question of how to maintain better diversification within the EM universe. Union Bancaire Privée is delighted to invite you to a free online presentation followed by a Q&A session about the outlook for high yield with CDS indices on the back of rising interest rates and higher inflation expectations. In this webinar followed by a Q&A session Eleanor Jolidon Taylor will share our view on the Swiss small & mid-cap market. In the past this market’s diversification with a mix of high-quality defensive companies and niche, innovative players has delivered significantly higher returns over time. The Swiss small & midcap segment is also characterized by companies which are often global leaders and therefore exposed to global economic growth. UBP is delighted to invite you to a webinar followed by a Q&A session hosted by Charlie Anniss. He will share our opinion on why the European smaller companies universe offers a wide range of investment opportunities with a wealth of niche, idiosyncratic, innovative and growing companies. Small and mid-cap companies in Europe are generally less well covered by the investment community and as such inefficiencies arise which dedicated active investors can take advantage of. In this web conference we will highlight why small and mid-caps are an appealing investment case, how UBP has tackled this dynamic asset class and what our preferences are in this market. China’s economic transition is well under way. Few investors continue to fear a hard landing, but the size of the country’s debt is a cause for concern. Register to the webinar and discover which investment opportunities as well as which challenges in Chinese fixed income and equity markets this new economy is creating. Union Bancaire Privée is delighted to invite you to a free online presentation followed by a Q&A session on Europe Equity. This year has been extremely tough but as time has passed we have formed some strong views on where the values lies within the European Equity Market. We believe that during 2016 we have witnessed an important turning point in market dynamics and have responded by building a “Barbell” based portfolio which we will discuss in details during this Webinar. CDS indices offer a full and liquid exposure to the high yield market. They have been outperforming high yield cash bonds since 2004. Union Bancaire Privée is delighted to invite you to a free online presentation followed by a Q&A session on the results of the UK referendum. What is the future of the UK and the European Union? Global Fixed Income allocation: what has changed ? We are pleased to invite you to a 40 minutes Webinar with Nicolas Delrue, Senior Investment Specilalist for UBP Convertible Bond Strategies. On this occasion, Nicolas will get back on the year-to-date performance of UBP’s core Convertible Bond Strategies. This will also be the opportunity to develop on the team’s outlook for the second half of 2016, as well as on the investment opportunities existing in the asset class, in a volatile and uncertain environment. This will lead us to address one key question : why should investors consider convertible bonds now ? Union Bancaire Privée is delighted to invite you to a free online presentation followed by a Q&A session on U Access – Best Selection China A. Could Chinese A-shares be included in the MSCI indices earlier than many think? Union Bancaire Privée is delighted to invite you to a free online presentation followed by a Q&A session on the Global & Absolute Return Fixed team’s favoured investment themes. Union Bancaire Privée is delighted to invite you to a free online presentation followed by a Q&A session on Swiss equities. Denis Girault, head of UBP Emerging Market Fixed Income team, will review investment opportunities in EM debt markets in the current environment of low commodity prices and Chinese GDP slowdown. This webinar will commence with a brief update from the PMs on how the main strategy, UBAM – Europe Equity, performed in 2015 with comments on the positioning for 2016. With the backdrop of a volatile start to the year, they will then discuss how investors could position themselves in this environment, highlighting two defensive strategies. This will be a chance to listen to our lead portfolio manager M. Kenji Ueno, who is positive for Japan - thanks notably to attractive valuation and on-going support from the Government and the BOJ. As the European Equity Team complete a very successful 5 years at UBP, we are pleased to invite you to a 30 minutes webinar with Rob Jones, co-Head of European Equities. The call will take place via the web-based platform BrightTalk. If you are not yet registered, you will have to do so to access the call. If you have any issues, please contact us. This will be a chance to listen to our lead portfolio manager M. Kenji Ueno, who remains positive on prospects for Japan for the remainder of the year - thanks notably to an expected turnaround in Japanese exports and domestic consumption. This will be a chance to listen to our EM strategist Koon Chow, who remains positive on prospects for emerging countries for the remainder of the year - thanks notably to an expected turnaround in China - as well as to Denis Girault, the head of the EMFI team, who will explain why emerging corporate bonds remain an investment of choice.